I am a 26 year old personal trainer based in Plymouth. When I started my fitness journey I had no idea what I was doing. My first long running event was Plymouth Half marathon in 2013 which lead me to go on to start educating myself on nutrition, training and wellbeing. In 2014, at the age of 22 whilst training for my first marathon I was diagnosed with type 1 diabetes. It has given me a greater understanding of those who suffer with similar conditions and what it takes to adapt to the many things that can stand in your way and inspired me to pursue a career in the fitness industry. Now I help others achieve their goals and transform their lifestyles to reach their full potential. "Dan has and continues to motivate me towards achieving my health and fitness goals, providing comprehensive assessments and tailored programmes to suit my needs. 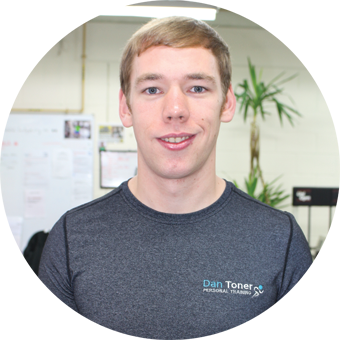 Dan has a chilled out but attentive approach and will push you to work hard but in an enjoyable way! Online Coaching - If you are looking for the guidance and support to achieve your goals this will be for you! Wether you train at the gym, or at home you will get your own plan that best suits your lifestyle. Without the constraints of where you are located affecting letting me help you get the body of your dreams. Ocean City Bootcamp - Suitable for any fitness level, a fantastic opportunity to meet other like minded people training at a high intensity using resistance training,body weight exercises, boxing and plenty of other training tools to keep things fun but challenging. All service users will have access to the members zone and mobile app for progress tracking as well as access to a private Facebook Members group to ask any questions you feel others may benefit from hearing the answer to and belong to a community of people all working towards becoming a better version of them self.